The Volkswagen Passat is a four-door, five passenger full-size sedan, and the Passat Wagon is a five-door, five passenger estate wagon. 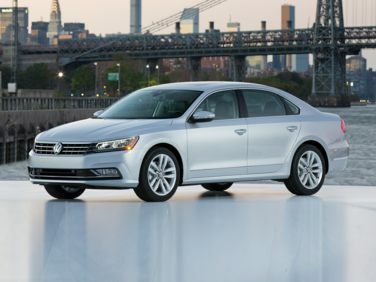 The Volkswagen Passat has been VW’s full-size family sedan for over 30 years. The many different iterations of the car have drawn their styling cues from diverse sources, and the vehicle has been offered in a variety of configurations, including all-wheel drive and a wagon. While in the mid-90’s, the Passat was based on the same platform as the Audi A6, in 2005 the vehicle was re-designed in order to fall more in line with the ideas and styling that Volkswagen explored on the ill-fated Phaeton. The 2009 Volkswagen Passat has followed the same path as the Jetta, and an attempt has been made to simplify the different trim levels available for the vehicle. The Passat is now available in 2 body styles (sedan and wagon), which in turn come in 4 different versions: the Turbo, the Komfort, the Lux and the VR6. Confusingly, the first three are all outfitted with the same 4-cylinder turbocharged engine, which generates 200 horsepower and 207 lb-ft of torque. The torque delivery on this motor comes on low, starting at 1800 rpm, which is quite helpful when it comes to motivating the somewhat heavy sedan and even heavier wagon. A 6-speed manual transmission is available on the base model, but a 6-speed automatic is the only gearbox outfitted on the higher trim levels. For both the sedan and the wagon, the base Turbo trim provides leatherette seats, a power driver’s seat, a trip computer, air conditioning and a number of other convenience features such as an electronic parking brake and speed-sensitive steering. The Komfort edition includes all of the base model’s features, but also adds satellite radio and a power sunroof, as well as improved leather accents and steering wheel-mounted paddles for shifting the automatic transmission. Finally, the Lux piles on fog lights, rain-sensing wipers, dual-zone climate control and special 17-inch alloy wheels. The top of the line VR6 replaces the 4-cylinder engine with a 280 horsepower, 3.6 liter V6. This engine knocks almost a full second off of the turbo four’s 0 to 60 miles per hour times, although it does gulp significantly more fuel around town. In addition to an improved interior and xenon headlights, the VR6 is also the only version of the Passat available with Volkswagen’s 4Motion all-wheel drive system. This feature makes the vehicle much easier to handle in snow and ice. The Passat Wagon is exclusively available with 4Motion when VR6 trim is selected. The inside of the Passat feels large and befits a vehicle of its size. Even those over 6 feet in height will be comfortable in the generous rear seating, with ample leg room for all passengers. Controls are laid out in an easy to use, flowing manner, and the build quality of the interior looks and feels excellent. The wagon offers almost 36 cubic feet of cargo volume, and folding down the rear seats adds even more room. When it comes to performance on the road, both of the available engines acquit themselves well, although the wagon does feel noticeably less sporty during hard driving. The 4Motion system is tied into the electronic stability control and electronic differential lock, and this helps it retain stable footing by adjusting power distribution and individual wheel braking in low-traction conditions. Both the Passat sedan and wagon make excellent, full-size family cars.